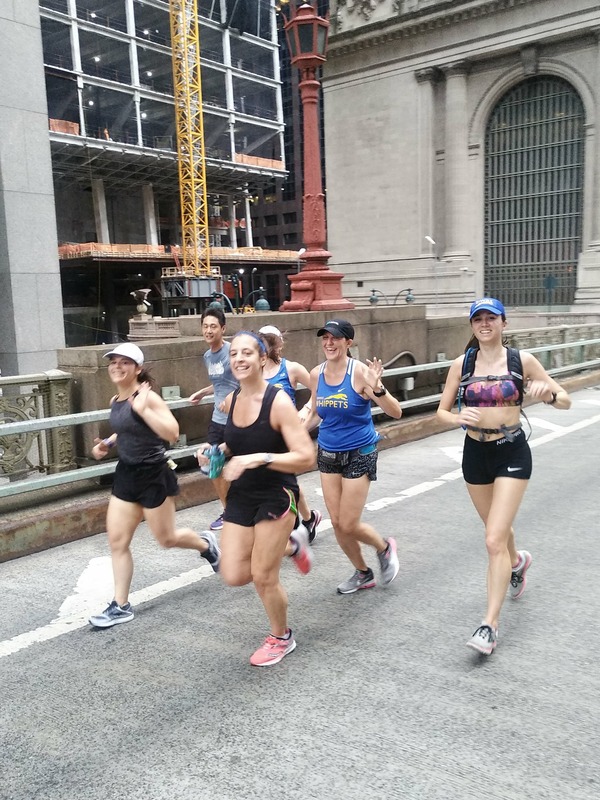 For the eleventh straight year, on the first three consecutive Saturdays in August, approximately 7 miles of New York’s streets extending from Brooklyn Bridge to Central Park were closed off to car traffic between the hours of 7:00 am to 1:00 pm. The New York City Department of Transportation ceded Park Avenue and connecting streets over to pedestrians, cyclists, and most importantly runners. Being a fall marathoner-in-training I’m of the belief the timing is not a coincidence. August in New York City promises steamy scorching temps that will soak your jersey and shorts within five minutes of getting out the door. For many of us, the effort increases while the paces plummet. Being the midway point in many marathon training plans means long runs range anywhere from 14 to 20 miles. Water fountains and gels become a runner’s most precious commodities — improvisation can sometimes mean stopping at a deli for gummy bears and bottled water, or in my case one year, gummy frogs and anti-freeze colored Gatorade. Summer Streets is a literal oasis offering well-spaced water stops and healthy eats. It’s become a testing ground for the newest entries in the hydration market and runners are willing guinea pigs. This year I extended the life of my long run on that first Saturday when I had the good fortune of running/struggling into an Obrigado Coconut Water stand. At around mile twelve of my long run I stopped to chug a bottle and not sure if it was my dehydrated state or the actual taste but it was, at that moment, the most delicious liquid I’d ever tasted. Bonus that many of these full-size samples are all free and the entire route is sprinkled with brands such as Nuun, Clif, Krave Jerky, Honest Tea, Bulletproof, and Skinny Pop to name a few. 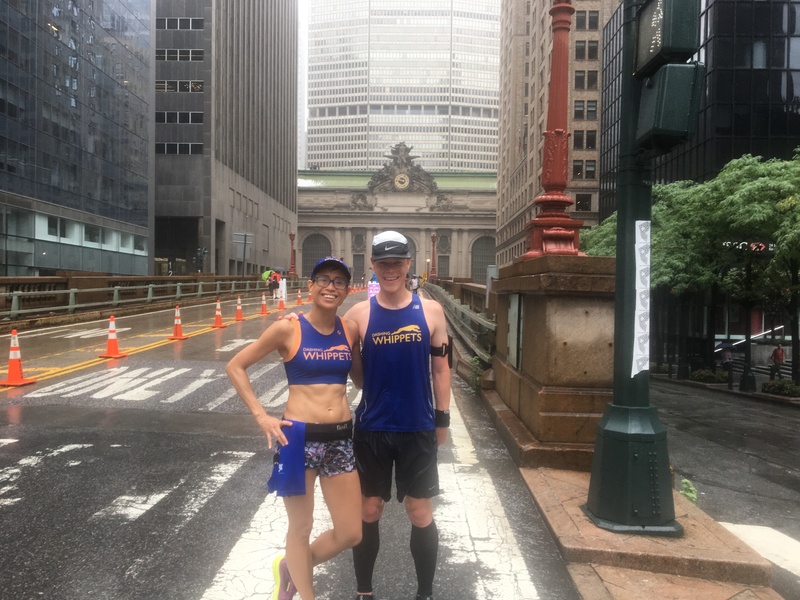 Snagging a nut-butter Clif bar downtown near Canal propelled me across the Brooklyn Bridge and gave me the energy to run the entire way home instead of hopping on a freezing subway car in soaked gear. Thanks Clif! Cyclists are given their own lane with pedestrians to their right. Major cross streets are manned by volunteers rotating stop/go paddles to allow for car traffic. 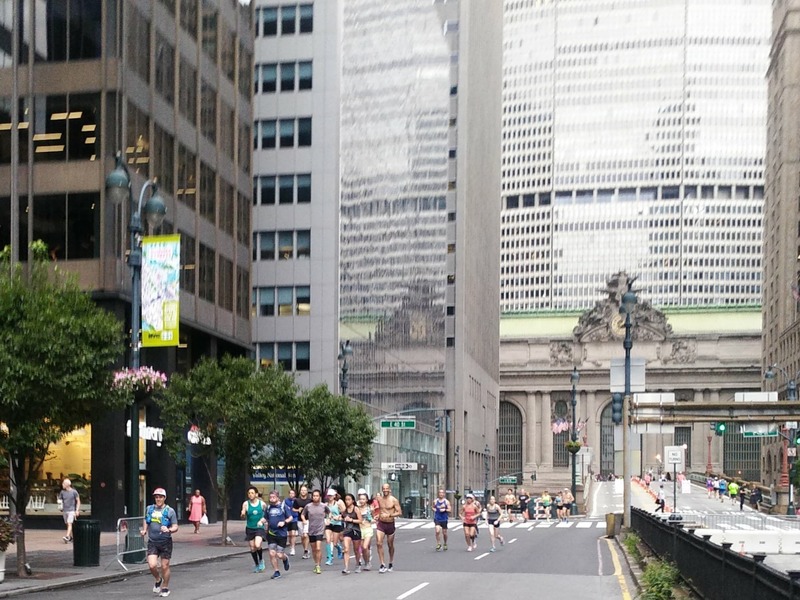 It’s a slight nuisance to interrupt one’s run but ultimately worth it to run on Park Avenue. 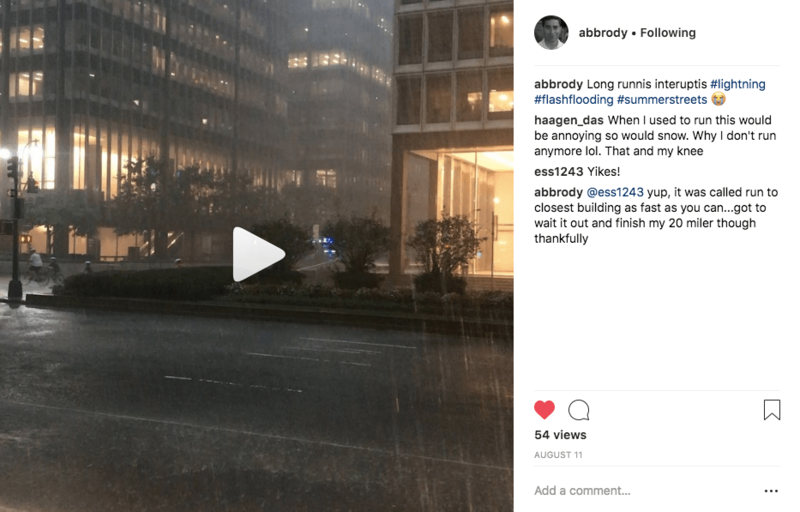 This year the first two Saturdays featured torrential downpours which meant only the hardiest ventured out to own the streets. This meant less baby strollers, tourists, kids on razors, and cyclists. 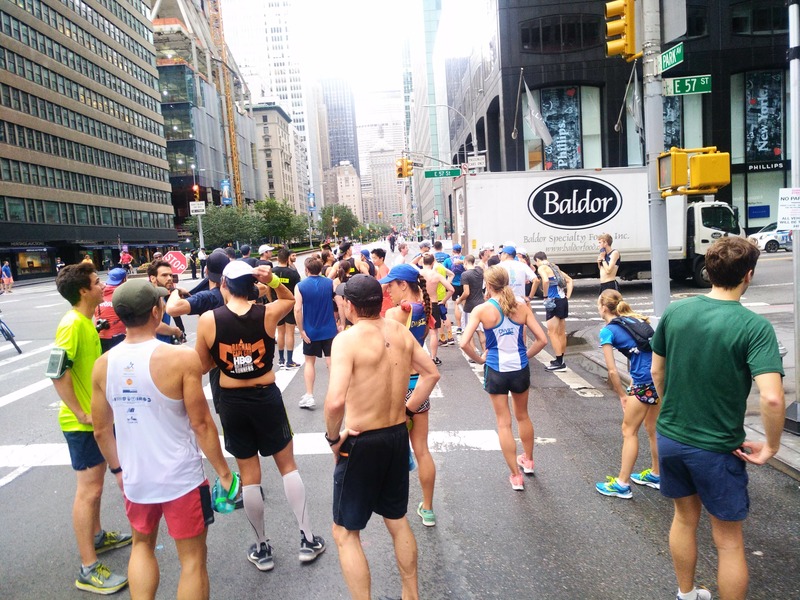 If my social and Strava feeds were any indication, it did not scare away runners. That first Saturday a massive crew met up at Time Warner Center and split into pace groups. I was running in the opposite direction from Brooklyn with Joe Siefers and we timed it perfectly to see teammates on flybys. We of course stopped at the overpass by Grand Central to take the traditional Summer Street pic. This feeling of owning one of the busiest streets in Manhattan never gets old. A tourist put her umbrella down to help us take a perfect set of photos. We happily returned the favor. Haley and crew owning the streets! That third Saturday was dry. Hooray! Dry skies that is. Temps were lower than previous Sundays but the oppressive humidity made a lot of folks miss the previous stormy conditions. 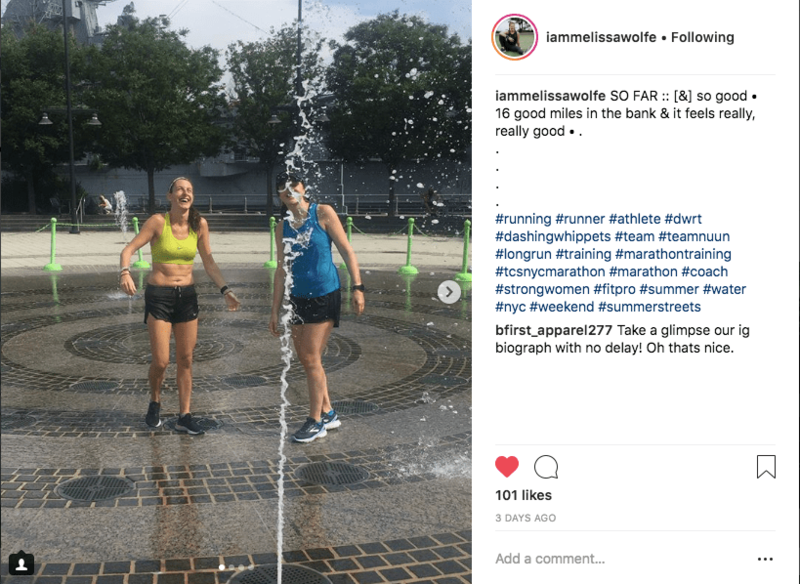 Melissa Wolfe and Cici Pandol treated themselves to a full-body fountain cool-down post long run. From Melissa’s Instagram. Long run relief means smiles for days! Now that Summer Streets is over, we face the first unassisted long run and are left to our own devices to provide sustenance. Hand-held water bottles, hydration packs, carefully mapped out routes with plotted water stops, and gels in shorts pockets will replace the miles of free food and drink giveaways. 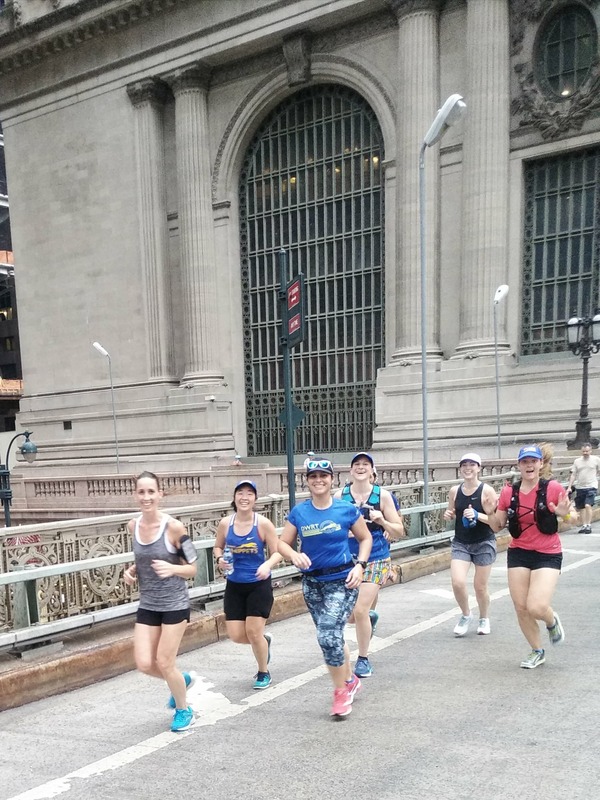 For three Saturdays, running, biking, and walking on a long stretch in Manhattan, made the city feel smaller. We waved to each other as we saw folks we knew pass by and it never ceases to amaze me just how often I run into people in the running community. A sea of blue and gold jerseys made it easy to play “I Spy a Whippet” and it felt like I never went a mile without seeing several. Until next year, thank you City of New York, for making us runners feel like we rule these big city streets but bring us together like it’s a small town block party.